Summer is the season of getting in shape mentally, physically, and financially. But forget making drastic personality changes, devoting hours of extra time to sweating at the gym, or forking over loads of cash. Sometimes the most dramatic lifestyle shifts are the result of tiny decisions we make every day. 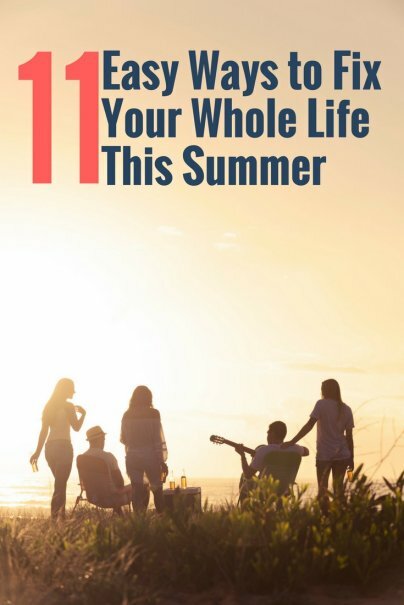 Here are 11 little lifestyle changes that'll get your whole life fit for summer — and the rest of the year, too. I hate to gross you out, but that phone in your pocket is literally teeming with germs. Various studies have found E. coli, MRSA, Streptococcus, and many other pathogens living on mobile phones. Keep yourself healthy by wiping down your phone thoroughly each day with a dry microfiber cloth. Disinfect it weekly using a microfiber cloth dampened with diluted isopropyl alcohol. Even on an overcast day, the sun can damage skin. Using moisturizer with SPF 30 or greater can shield your skin from harmful UV rays, slow the development of wrinkles, minimize redness, and reduce the risk of skin cancer — all without adding another step to your morning routine. Humans are social animals. Spending time with close friends improves your mood, increases self-confidence, and helps you navigate life's ups and downs. Instead of relying on random get-togethers, make a weekly date to spend quality time with those you care about most. If it won't ruffle any feathers, suggest these events be screen-free and revel in the old-fashioned art of conversation. It may seem trivial, but making your bed first thing in the morning sets a positive and productive tone for the rest of the day (hospital corners optional). Sitting is the new smoking, and we're all doing way too much of it. Walk the dog, take the stairs, mow the lawn with a push mower, schedule an outdoor work meeting and go for stroll — just try anything that will get you moving more each day. The busier we are, the more quality sleep matters. Invest in a few things that will transform your bedroom into a sleep-inducing oasis: Consider blackout shades, a white noise machine, quality linens, and comfortable pillows. If a new mattress isn't in your budget, add a memory foam or pillow-top mattress pad. Once your sanctuary is set, fit more naps into your life. A 20- or 30-minute catnap can improve alertness and mood without disrupting your nighttime sleep schedule. While we're on the topic of good sleep, resist checking your email right before bed. Trust me, nothing good can come from it. Inevitably, there'll be a message that gets your mind buzzing or makes you anxious about the coming workday. Establish a media cut-off time and stick to it. Cluttered spaces can be overwhelming, difficult to clean, and bad for your mental health. Become a zero-accumulation household by following one simple rule: For every new item you bring into your home, donate or sell an item of similar size. Already drowning under a pile of junk? Purge three or four items for every new one you add. Saving money is empowering. Properly managed, a healthy nest egg can help you fund a new career, start a family, or become a homeowner. Push yourself to save an extra five percent of your net income. Buy generic, cut the cord on cable TV, or explore ways to lower your cell phone bill. In short, do whatever it takes to beef up your bank account. Your future self will thank you.